Whether on frames, furniture, porcelain or objects we provide a full range of techniques using a variety of materials. We specialize in the ancient practice of water gilding, and use real gold leaf, silver leaf, or whatever material is appropriate to the piece. 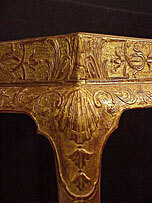 Finishes are toned, aged or distressed to match the original object, or to the customer's specifications. 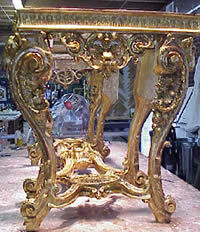 We offer the restoration of gilded and polychromed or painted furniture only, specializing in the damaged finishes rather than major structural repair. 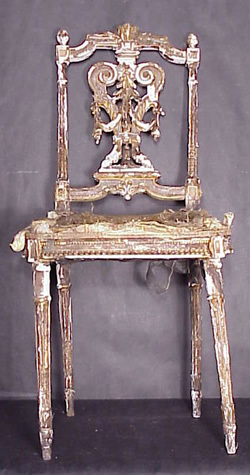 An Italian Neoclassical carved giltwood console table, 4th Quarter 18th century. 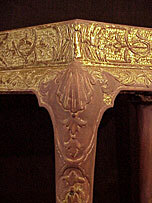 Detail of side of table. Original finish nearly completely lost from over-cleaning and wear. Severe chipping and loss of carving throughout. 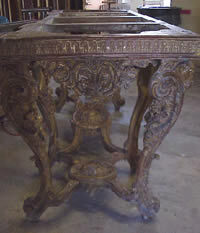 Completed table after fine carving, gesso, bole, water gilding, distressing, toning and sealing to protect it from further damage. 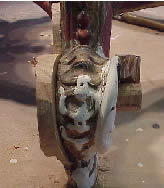 Detail of scroll foot before restoration. Complete loss of detail to left side and inside of right carving. 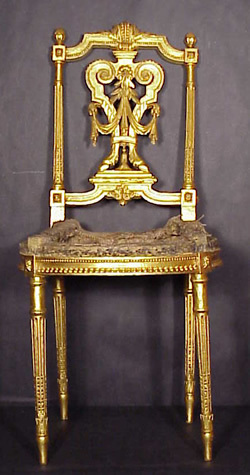 Original gold leaf finish totally gone due to water damage and wear and tear. 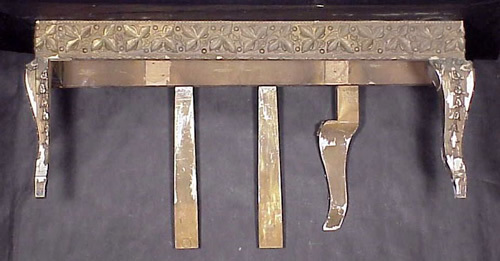 Detail of repair to foot. Roughed out oak was applied to area of loss before final carving was completed. 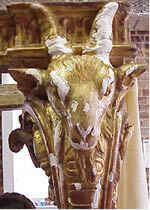 Ram's head detail with gesso fills where original surface had been lost. 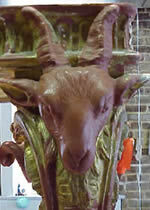 Ram's head after several layers of gesso and bole were applied in preparation for water gilding. 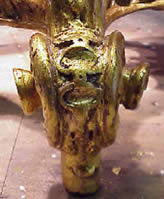 Detail of the carved female mask enclosed by c-scrolls on center of table. Note severe loss of finish and chipping throughout and above on running egg and arch frieze. 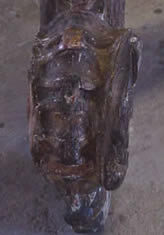 Female mask carving with gesso and bole fills. 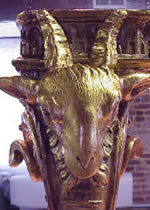 Much of original gilding was salvageable and so "spot gilding" was sufficient to restore the losses.